I don’t feel like you need me to tell you to go buy Spinning Silver, but here you go. There’s already so much hype for this release and with good reason. 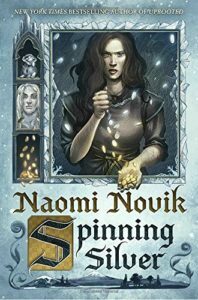 Spinning Silver was my first Novik book, but it won’t be the last. I am thoroughly enchanted. There aren’t enough words in my vocabulary for this book – which could just be the best book I’ve read all year. To say I loved Spinning Silver is a gross exaggeration. I adored, was enthralled, am bewitched by Spinning Silver. I’ve recommended it to more people in 30 minutes than I have ever with another book. This is my first Naomi Novik book, even though I own Uprooted and now I’m obsessed. Having seen her speak at BEA I knew there was something special about this book and I was not disappointed. There was such hype for it and, believe me, it’s all real. So I’ve tried really hard to make this review not just be flailing around. Because it’s hard. I’ve waited days and all I can still do is scream about this book. It’s one of those books that grabs you by the heart and won’t let go. Or is that just me? It has thoroughly enchanted me with it’s re-imagination aspects, it’s fierce female heroines, and it’s lush world building. I would posted the walls with this book. But you see? Still flailing about here because I can’t form really coherent thoughts. All the hype you’ve ever heard for this book is real. The world building is lush. It feels cold to the touch. The only thing I can imagine it’s like is being lulled by a magical lullaby convincing you to lie down in the cold snow, knowing it could be your death, but not caring because the tune is so lyrical, so ethereal. That’s what the world building of Spinning Silver is like. It’s not like dying, but if it was, this would be the sweetest, and coldest. There is unique magic where it retains certain elements of Rumpelstiltskin while departing from it, transcending it. It isn’t so much of a re-telling as it is a re-imagination. I could walk into this world in a heart beat, having poured over this book, and still be surprised by its depths. It’s the type of world building which is so detailed, yet mystical. You can see the leaves, the trees, the forest with such clarity, just like you can feel, with such accuracy, the foreboding in your gut, the tangible dread. These characters are complex and empathetic. They tug at your heart, pulling it in every direction from rage, to love, to forgiveness. There are such good villains in this story, because they aren’t just straight black and white. You can understand them, feel their pain and witness their aloftness. All of our characters move throughout the world with all shades of grey in between. We are left to make up our own mind at the end of the day, to feel our emotions twisting. The characters are incredibly layered. They are real, flawed, and shinning. Every one of our female characters are fierce and multi-dimensional. I make special note of the female characters, but every character is given their due complexity, their petty grievances and their reluctant compassion. There are mothers and mother figures. There are parallels and reflected choices. At the same time, one of the larger themes of Spinning Silver is family. There are families of blood and of choice, and which ends up being stronger in the end? Can we break the hold of our family? Can we accept their help? In the end of the day, how do we find our family, convince ourselves of our worthiness, and walk away from those toxic relationships? Closely connected to this theme, is the theme of agency. What will we do for freedom? What are we willing to trade? All of our characters are asked to make difficult choices, to make hard decisions, and are asked just exactly what are they willing to do? Spinning Silver looks at the cages we are born into, the ones we walk into, and those we make ourselves. It emphasizes the strength in community, slow and resourceful planning, and compassion. Spinning Silver really is my kryptonite. It has all of these elements which would be on the check list of ways to entrap me: fierce women, fairy tale elements, and magical worlds. This is the book of my heart. I couldn’t put it down. In the end, I wanted to savor it all and I am truly jealous of all of you who haven’t read it and who will have the experience of reading it for the first time. I wish I could read it anew all over again. Check out Spinning Silver on Goodreads, but seriously, just go buy it. It’s gorgeous on every single level. Consider me SO CONVINCED RIGHT NOW.I read Uprooted and I liked a lot about it but like…not super much enough to be keen to pick up Spinning Silver? But I feel like I’m massively missing out if I don’t?! I LOVE the sound of those themes particularly and the writing sounds divine. YES! I mean I haven’t read UPROOTED and the people I know who have read both said they liked UPROOTED more….but /shrug. ahhh have you devoured it yet?? Yes!! It was lovely. I personally connected more with Uprooted but I already know I’ll be rereading this one too.